Tar Heels, if you’re still hanging around the general vicinity of North Carolina this summer, you don’t need me to tell you it’s hot, but…OMG it’s sooooo hot! If you’re anything like me, a long string of hot days might make you complain a lot and think less clearly than you might otherwise. Also, while the pictures on my Facebook feed tell me that this is vacation time for a lot of people…it might not feel like vacation time for all of us. Yes, NECESSITY, as well as our culture that socializes us to ideals of BUSY! and ACHIEVEMENTS!, can chase us down even into these summer months. 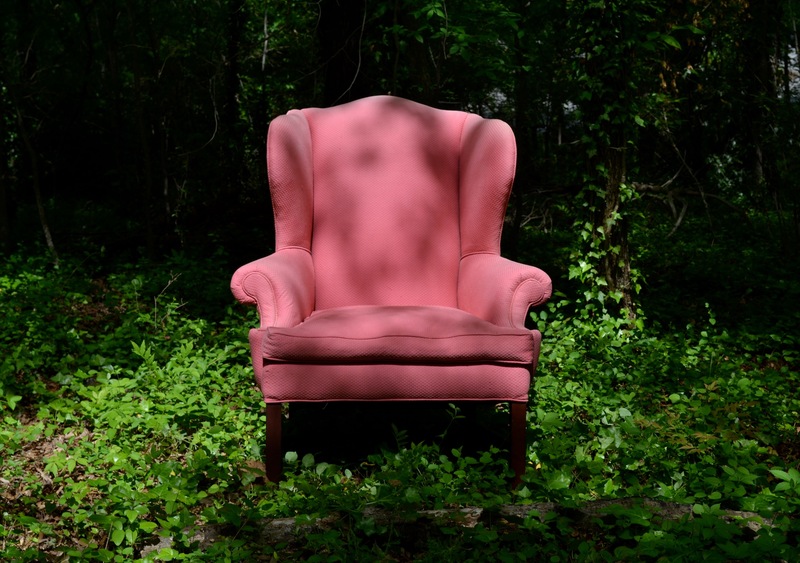 Here is a comfy pink chair in the forest a person might sit in if they were taking a break. Finish reading this blog post and then turn off whatever screen you’re looking at for at least 5 minutes. Feeling brave? Do it in silence. Feeling tense? Think about relaxing each part of your body, starting with the toes and working your way up. It’s just 5 minutes. You can do it. Too easy? Make a summer resolution to do this every day and see what happens. Call a friend you haven’t talked to in a long time and catch up. Commit to listening to an entire album you haven’t heard ever or haven’t heard in a long time. Do it in one sitting. Invite some buddies over for a listening party. Find a path you’ve never walked and walk it. (If you’re in Chapel Hill, consider these!) Find some flowers and sniff them. Take a social media hiatus. Y’all. I haven’t been on Facebook for 3 days and I feel like a new person right now. Drink some water. It’s hot. Do something you haven’t done since you were a kid. Is there a swing set at your apartment complex? Can you get your hands on a pool noodle? Are there old board games for sale at PTA Thrift Shop? Where are those crayons your roommate was waving around? Can you YouTube your favorite old cartoon? Plan a day trip to a swimming hole or a waterfall. Cook something for dinner tonight that you’ve never cooked before. Never cooked at all? Then this assignment has NO LIMITS! Read a book…for fun. When was the last time you read a book for fun?? Other ideas? Do share in the comments!